It was a Christmas with a difference in the town as Congress supporters donning green Kinnauri caps, identified with Chief Minister Virbhadra Singh, outnumbered tourists as he took oath this morning. Newly elected legislators to the 12th Vidhan Sabha will take oath during the brief winter session of the Assembly to be held in Dharamsala from January 8 to 11. The decision to hold the winter session in January was taken at the first Cabinet meeting of the new government, chaired by Chief Minister Virbhadra Singh, here today. Ignored by former Chief Minister PK Dhumal, Brahmins have got due representation in the new ministry under Virbhadra Singh, who promptly inducted three Chief Parliamentary Secretaries (CPSs) to provide representation to left-out districts and castes. 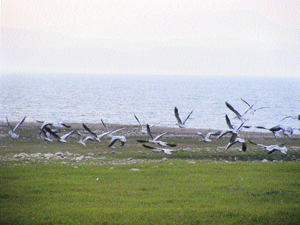 As many as 87,000 winged visitors of more than 90 species from the Central Asian countries were attracted during the first two months of the winter season by the sprawling Pong Dam wetland, nestled in the sylan surroundings of the Kangra valley, which had emerged as a major habitat for the migratory birds. The newly formed Congress government has for the first time gifted Solan constituency with a ministerial berth with MLA DR Shandil being sworn in as a minister today. Though the portfolios were yet to be allotted to the ministers but Shandil’s elevation has brought cheer to the Congressmen of the Solan constituency, which had remained unrepresented in the earlier regimes of the Congress in the state. B Kamal Kumar, Director-General of Police (DGP), Home Guard, was today given additional charge of the CID, relieving DGP ID Bhandari of the charge. KC Sadyal, Additional Director-General of Police (ADGP), State Vigilance and Anti-Corruption Bureau, was posted as the ADGP, Armed Police and Training. Prithvi Raj, ADGP, Armed Police and Training, was posted ADGP, State Vigilance and Anti-Corruption Bureau. Abhishek Trivedi, Deputy Inspector-General (DIG), Administration, Police Headquarters, was posted as DIG, CID, in place of RM Sharma, whose posting would be given later. Resuming the process of organisational elections, which had been put on hold due to the assembly polls, the BJP today appointed the district election in-charge for all the 12 districts. Jyoti Devi, a BA final year student of Government College, Hamirpur, has brought laurels to the state by winning silver and bronze medals in the national athletic meet held at Chennai from December 5 to 8. Fresh from the triumph in the audio CD case registered against Virbhadra Singh and his counsel, Sharwan Dogra was today rewarded with coveted post of Advocate General of the state government. The Cabinet today welcomed the judgement of the Special Court in the CD case acquitting Virbhadra Singh and his wife Pratibha Singh. Residents of Aghar ka Talab, near here, caught a man committing burglary in a shop in the village in the wee hours yesterday. The accused was identified as Ravinder Kumar from Chamba district. With the minimum temperature recorded at 5 degree Celsius, there were bleak chances of a white Christmas. The town was soaked in political colour. Thousands of Congress supporters danced on a warm balmy morning, unusual for this time of the year. The political change in the state was evident as a sea of green caps was noticeable on the Ridge and the Mall. Hotels were booked to capacity with Christmas revellers thronging the town in the hope of a white Christmas, but they were greeted with a different atmosphere as slogans of ‘Raja nahin faqeer hai, Himachal ki taqdeer hai’ resounded. 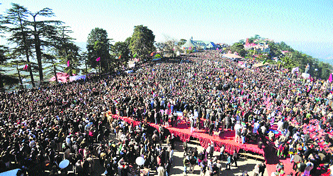 Added to the rush of tourists who thronged the town for Christmas celebrations was the unending stream of supporters of the nine ministers and three Chief Parliamentary Secretaries who took oath along with the Chief Minister. Attired in their traditional attire and playing ‘Pahari’ musical instruments, supporters thronged the venue of the oath-taking ceremony, the Ridge, early in the morning. Traffic arrangements in the town went haywire. There were traffic jams at various points in the town with vehicles moving at a snail’s pace, rendering security and traffic arrangements for the occasion inadequate. Swanky cars bearing red beacons and National Flags were lined up on the Ridge to ferry ministers to the Secretariat. After the swearing-in, supporters made a beeline to the Secretariat to greet them at their newly done-up offices. All restaurants and hotels were packed to capacity as people waited to get a table. Animated political discussions continued with speculation about the possible portfolios of the ministers and the impending bureaucratic reshuffle. Bureaucrats and police officers who remained sidelined during the five-year regime of the Bharatiya Janata Party could be seen back in the corridors of power. A majority of them are already back in the Chief Minister’s office. Others are hoping to be rewarded with plum postings on the grounds of having been victimised by the previous government. Career Summary: Elected to Lok Sabha in 1962, 1967, 1972, 1980 and 2009. Remained Deputy Minister of Tourism and Civil Aviation from December 1976 to March 1977, Minister of State for Industries from September 1982 to April 1983, Union Minister for Steel from May 2009 to January 2011 and Small and Medium Enterprises from January 19, 2011 to June 2012 at the Centre. 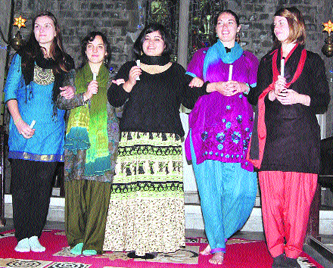 Social and Cultural Activities: Associated with number of cultural and social organisations as Indo-Soviet Friendship Society. Friends of Soviet Union (now Russia). President of Sanskrit Sahitya Sammelan, Himachal Pradesh. Member of Estimates Committee, Lok Sabha, Railway Convention Committee, Chairman, Petition Committee, Lok Sabha. a) Honorary Captain in the Indian Army. b) Awarded Silver Elephant for Contribution in Scouts and Guides Movement. c) Awarded Golden Peacock Environment Leadership Award by London-based Institute of Directors for Contribution in Promotion of Environment, Wild Life, Environment Governance and Eco-Tourism. The election of the Speaker and the Deputy Speaker would also be held during the winter session. Being the first session of the year, it was also decided to hold the Governor’s address during the winter session. The Cabinet also decided to adopt the Congress manifesto for the elections as official document of the government. In another significant decision, the Cabinet decided to review all decisions taken by the previous regime during the last six months of its rule. A decision was also taken to frame a policy for the regularisation of PTA teachers in the state. The Cabinet also decided to review the closure by the previous regime of all notified schools opened by the Congress in its earlier tenure. It was also decided to terminate all extensions and re-employments granted to officers and other employees forthwith by the previous regime. It was also decided that employees on a secondment basis in the state Secretariat who were reverted to their parent departments would be taken back in the Secretariat. It was decided that criminal cases registered against people on political considerations and for holding agitations where no violence and breakage was involved would be withdrawn. 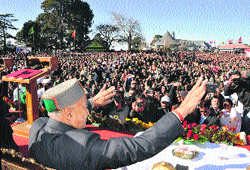 Virbhadra thanked the people of Himachal Pradesh for voting the Congress to power. Neeraj Bharti, son of senior Congress leader Chander Kumar, was appointed CPS from Kangra to give representation to Other Backward Classes (OBCs). Rajesh Dharmani and Vinay Kumar are from the districts of Bilaspur and Sirmaur, respectively, which have not been represented in the ministry. Now only Kullu and Hamirpur districts have been left unrepresented. Tribal areas, which include Lahaul-Spiti and Kinnaur districts, have also been given representation by including Thakur Singh Bharmouri in the Cabinet. As always, the maximum number of four ministers, Virbhadra Singh, Vidya Stokes, Kaul Singh and Sujan Singh, are from the Rajput community. However, there are three Brahmin ministers, GS Bali, Mukesh Agnihotri and Sudhir Sharma, in the 10-member Cabinet. The previous PK Dhumal government had only one Brahmin, JP Nadda. After he resigned, the berth remained vacant for about 20 months. Khimi Ram, another Brahmin, was inducted a few months before the elections. There are two ministers from the Scheduled Castes (SCs), Prakash Chaudhary and Dhani Ram Shandil, in the Cabinet. If one takes into account CPSs as well, the number of Brahmins goes up to four and that of SCs to three. Another SC leader, Kuldeep Kumar, is being tipped for the post of Speaker. The Cabinet is better balanced than Dhumal’s, which had 10 of the 12 ministers from Mandi and Kangra (4 each) and Hamirpur (2). 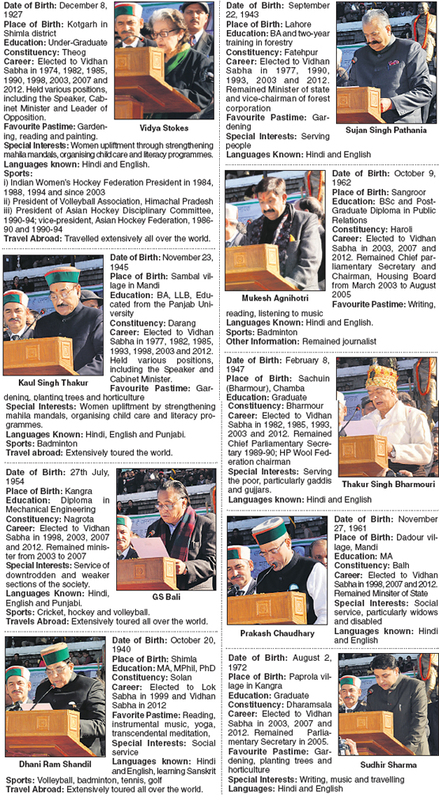 There is one minister each from Shimla and Kulu districts. Even caste-wise, the Dhumal ministry was not balanced, with ministers from the Rajput community and three from OBCs. One minister each was from the SC and Brahmin communities. Assistant Conservator of Forests (Wild Life) DS Dhadwal today said the migratory birds from trans-Himalayan regions had started reaching the Pong Dam wildlife sanctuary since October last year and about 87,000 migratory birds of more than 90 species had landed at different places of the Pong Dam reservoir till today with maximum 27,000 bar-headed geese. He said 30 greater white fronted geese, a rarest of rare species, too arrived here. Among the rare species which had arrived included greater painted snipe, cinnamon bittern, black bittern and red crested pochard, Dhadwal said. so far. The other bird species that arrived included mallards and coots, besides rare red-necked grebe and gulls. These species came from Afghanistan, Mongolia, China, Siberia, Central Asia, Russia, Pakistan and Ladkh, Dhadwal said. He said the swamps in the area between the Barrage and the Shah Nehar down streams had made majority of the species to stay here for the season. Dhadwal said about 415 species were recorded at the Pong Dam during the last ten years and the chances of new species to arrive here were very less, however, Salcated Duck, a new specie, had arrived here last year and Ruddy Brested Crake, a new specie, had arrived at Sansarpur Terrace locality this year, which was detected by him and Dr Abhinav, thus taking the number of the migratory species to 417 species. Build in 1960, the Pong Dam reservoir is the only place in the country after the Bhartpur Sanctuary where the red-necked grebe descends every year. The arrival of gulls on this lake make the Pong Dam an exception. The water body occupies an area of at least 18,000 hectares and extends up to 30,000 hectares at the peak moon soon. An area of about 20,000 hectares within the radius of 5 kms has been notified as the buffer zone. However, when the water-level remains low, there is abundant aquatic vegetation on the lake and mixed perennial and deciduous pine forests on the hill sides provide enough food and shelter to the migratory birds. The lake was a well-known wildlife sanctuary and one of the 25 international wetland sites was declared in India by the Ramsar convention. According to the wildlife officials, illegal poaching during the winter season remains a matter of concern and to ensure safety of migratory birds, a decision to involve villagers was taken. Officials said the village and forest development committees would work under the supervision of deputy range officers and would monitor activities of poachers in the Pong Dam area. Last winter, more than 1.20 lakh migratory birds had arrived in the Pong dam. The BJP, on the other hand, had given due representation to Solan on two occasions where Dr Rajiv Bindal and MN Sofat had remained ministers in two tenures of the BJP governments in the state. However, earlier Congress MLA Raghu Raj from Kasauli and Vijender Singh from Nalagarh had remained ministers in the earlier tenures of the Congress from the district. Since Shandil is the lone member of the significant Congress working committee from Himachal, the Congressmen in the district were hopeful of his elevation as the minister. The development would also help unify the Congressmen in the district which in the absence of a strong leader had been facing a vacuum and adversely suffering in the subsequent elections. With the Congress having won barely two of the five seats in the district, Shandil’s elevation was being considered a big achievement for the Solan district, where the Congress had lost all the five Vidhan Sabha seats in 2009. Formal orders of some postings in the Chief Minister’s Office were also issued today. VC Pharka was appointed Principal Secretary to the Chief Minister. Retired IAS officer TG Negi was appointed Adviser to the Government. Amit Pal Singh was given charge of Officer on Special Duty (OSD). JC Chauhan was posted as the Private Secretary to the Chief Minister. On the first day today, only a few transfers of the top brass of the police were ordered. A major administrative reshuffle is also expected in the next few days after the Chief Minister returns from New Delhi, where he is scheduled to attend the meeting of the National Development Council. The government also cancelled the study leave to Nagin Nanda, an Indian Forest Service officer posted as the Secretary, Environment. It had been sanctioned by the previous government. State General Secretary of the BJP Chandermohan Thakur today made the appointments of 12 district election in-charge for the smooth conduct of the party elections as per the BJP Constitution. Thakur also fixed the date for holding of the elections for the polling committees between January 5 to 12, the mandal elections between January 14 to 21 and the district president and state executive members between January 22 to 30. The 12 district election in-charge included Kripal Parmar from Bilaspur, Ramswaroop Sharma from Kangra, Vipin parmar from Chamba, Rajeev Bindal from Shimla, Vikram Thakur from Kullu, Praveen Sharma from Mandi, Ajay Rana from Kinnaur, Balbir Bagga from Sirmaur, Ganesh Dutt from Solan, Pyare Lal from Una, Randhir Sharma from Hamirpur and Praveen Sharma from Lahaul Spiti. Sources said the government swung into action and sealed the room to prevent further destruction of any recordings. Chief minister Virbhadra Singh said the machine was misused to record the conversation of political opponents of the BJP and others close to the Congress at the behest of Dhumal regime. Sources said the hard disc of the machine was handed over to Subhashish Panda, Deputy Commissioner, Shimla. Sources said the phone tapping machine was used to record telephonic conversation of politicians, bureaucrats and journalists during the Dhumal regime. Jyoti, a resident of Soldha village in Jawali sub-division, has won silver medal in the 400m race and bronze medal in the relay race. Her father Sardar Singh feels proud of her daughter. He said Jyoti was very keen to participate in the athletic meet and she had succeeded in her mission. Earlier, Jyoti took part into the inter-college athlete championship organised at the Government College, Hamirpur, from November 8 to 10. Her coach Bhupinder Singh said she had the potential to beat international athletes as well. He expected her to bring laurels to the state at the international level. court, in which Chief Minister Virbhadra Singh had acquitted in the CD case. Sharwan Dogra, who remained the president of the HP High Court Bar Association and was twice elected as the member of the HP Bar Council, assumed the charge of Advocate General. Enrolled as an advocate since 1983, Dogra had been practicing in the state High court in all the fields, including the constitutional, civil, labour and service laws. Apart from this he remained the standing counsel for the state electricity board, Municial Corporation, Shimla, and National Institute of Technology, Hamirpur. They said the verdict had exposed the designs of the PK Dhumal regime, which was to implicate Virbhadra in false cases. “Dhumal and the other BJP leaders owe an apology to the Chief Minister for their motives and misleading the people of the state,” they said. Bundles of copper and electricity wires were recovered from his possession.